Whenever there is a party, it's pretty much an unwritten rule that I'm the one who is going to bring dessert. My parents threw a little 4th of July party this past weekend, and I was toying with the idea of making a cake, but I wanted to bring a dessert that just screamed summer. 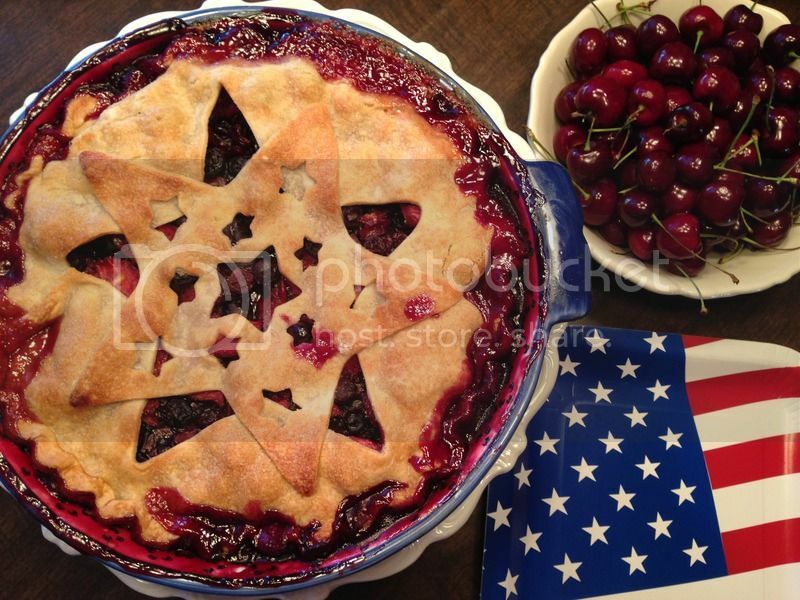 After thinking about it for a bit, I decided on an All-American pie...a triple berry pie to be exact! I found a great looking recipe on the Pilsbury website, and just tweaked it a little since I had blueberries, strawberries, and cherries on hand. This pie turned out incredible and definitely tasted like summer! Directions: Heat oven to 450°F. Make pie crusts as directed on package for two-crust pie using 9-inch pie pan. In large bowl, stir together 1 1/2 cups sugar, the cornstarch and salt; gently toss with berries. Let stand 10 minutes. Spoon into crust-lined pan. Top with second crust in whole form or lattice top. Brush crust with milk; sprinkle with 2 teaspoons sugar. Place pie on middle oven rack; place large cookie sheet on rack below pie pan in case of spillover. Bake pie 15 minutes. Reduce oven temperature to 375°F. Bake about 40 to 45 minutes longer or until crust is golden brown and filling is bubbly. Let stand 2 hours before serving.